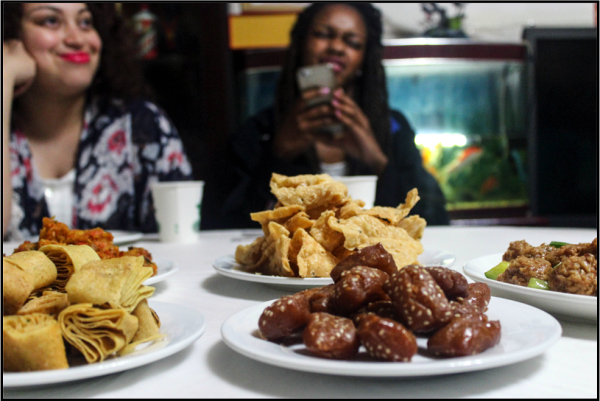 School Daze is a series written by contributor Eileen Salazar, who discusses her 2-week trip to China. Eileen is a sophomore at Howard University in Washington, D.C. In America when we hear ‘Chinese food,’ we automatically think of tasty orange chicken, egg rolls, and kung pao. As I embarked on my journey to Beijing, I was expecting the same food but my expectations were about to be blown out of the water. Our first dinner in Beijing had to be one of the best dinners of the entire trip. It was a traditional Chinese dinner that consisted of white rice, spring rolls, beef and squash, chicken with scramble egg, sweet soup, fish, and potatoes. Every meal is served with jasmine tea and one extremely small cup for soda. The food was amazing! Surprisingly, most of the dishes tasted like American Chinese food, only ten times better. Everything was seasoned to perfection. The only dish that I didn’t enjoy (everyone on the trip agreed) was the soup. Typically, soup is salty but this soup was served cold and had a really sweet aftertaste. The next day we had traditional Peaking Duck Dinner, also called Beijing Duck. I was initially a bit hesitant but that soon disappeared when I saw how delicious all the food looked. The proper way to eat the duck is to make the Chinese version of a burrito. You grab a thinly sliced tortilla-like wrap, add the duck, cabbage, and the special sauce. The “burrito” was out of this world. The duck was so tender that it just melted into your mouth. At night we got on Rickshaws (sort of like a horse and carriage ride but instead of a horse, it’s a bicycle) to ride to a local family’s home in the HuTongs for dinner. The food was typical Chinese cuisine like the food we had the first day. But the cool part of this dinner was that the chef had previously worked for the former President of China for 10 years. He had only been cooking for two years for the military before he was hired as the President’s chef, which is a very high honor in China. Walking into China’s street food market, The BBQ, I was met with this awful stench of insects being cooked. Yes, I said insects. I know, ew. Here you find the widest range of street cuisine anything from frozen fruit to cooked scorpions. 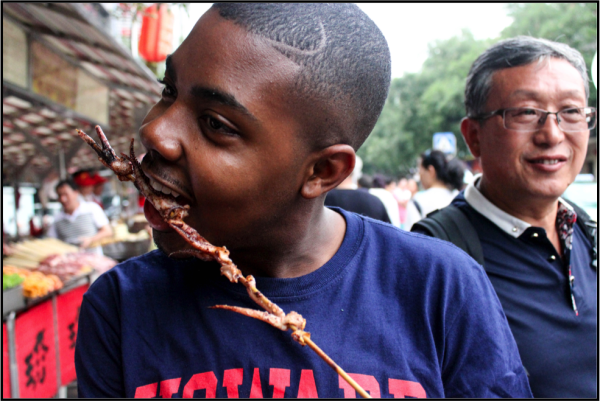 Prior to this trip I wanted to try a fried cricket but being face to face with the opportunity, I couldn’t fathom the idea of swallowing it. Thinking back on it, it’s ironic how they call it ‘The BBQ’ because there is definitely nothing there that resembles traditional American BBQ. I hate tea. Hate is such a strong word, but I honestly despise tea. So when I saw we were going to a tea house, I wasn’t a bit excited. To my surprise, I loved the teas we got to try. I liked them so much I ended up buying two teas. One was fruit tea which can be drank hot or cold and the other one was shenshen tea, which is supposed to help with energy and skin. Now that I’ve had authentic Chinese food, I still haven’t been able to eat American Chinese food. No longer does orange chicken and fried rice “hit the spot” like they used to. All in all, the food across the board was absolutely amazing. I strongly recommend any one traveling to China to dive into the food and enjoy! In 2008, the 29th Olympic Games were held in Beijing, China. Thousands of viewers were enticed with visuals of the Chinese culture and at that moment I knew that one day I’d be going to China. Fast forward seven years later and amazingly, I have been given the opportunity to go to China for two weeks! I was given this opportunity through an organization that I am a part of at Howard University called Freshman Leadership Academy (FLA). Every year they plan a trip to China so that members can fully immerse themselves in a culture that is completely different than their own. This year will be the 5th year that FLA will be making this journey. Beijing, the capital and the second largest city in China, will be our first stop. Of course, we will be visiting popular tourist sites such as The Great Wall of China, The Forbidden City, and Tiananmen Square. But I’m most excited about having a traditional peking duck dinner with a local family. Our group also wanted to add a community service project to our itinerary, so we will be visiting a local orphanage, Shepherd’s Field. We’ll be spending time with the children and donating toys, clothes, and books. My next stop will be in Shanghai. I’ve been told that Shanghai is a lot more modern then Beijing since it’s changed drastically in the last 20 years. Because it is known as the financial and business center of China, we will be visiting the World Financial Center and the Silk Market. If you’ve never heard of the Silk Market let me introduce you! From what I have heard it is a bargain shoppers’ dream land. You can get custom tailored suits for as low as $80 dollars (takes about three days to finish), you can find Beats headphones for $40-$50 dollars, and a surplus of other electronics for an extremely affordable price. All in all, I am super excited for this trip. It is planned at the perfect time; right before I have to go back to school and hit the books. I look forward to sharing my experiences with you. Till next time!